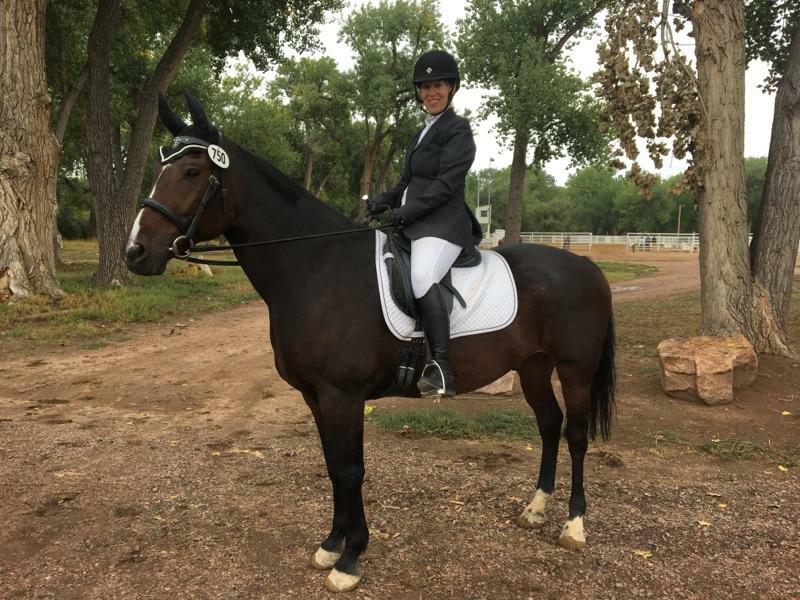 When dressage enthusiast Katie Knight started hanging out with a group of eventers in Colorado, she quickly realized her new friends had a different and bolder take on the sport. Knight, 58, has a condition called wet macular degeneration, which causes blurred vision or a blind spot. Her left eye was diagnosed in 2011 when she began losing central vision, and in 2014 it showed up in her right eye. She has some peripheral vision but is no longer able to drive. She and her husband, Doug Knight, then moved to Pueblo, Colorado. But while she could live without driving and leave her job, she wasn’t ready to give up riding. “I don’t remember a time I wasn’t crazy about horses,” Katie said. A horse-crazy aunt recognized a fellow equine addict and nurtured it in her childhood. Katie rode mainly western, and after completing her undergraduate degree at Washington State University, she went to law school at the University of Washington in Seattle. It was there she started riding hunters and jumpers. 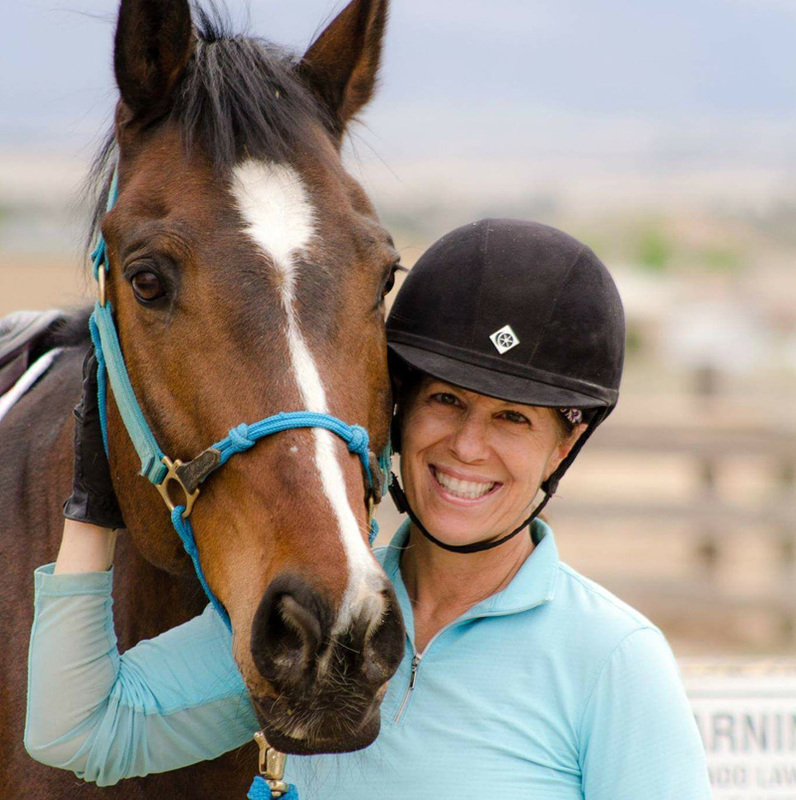 She bought her first horse, a half-Arabian named Fleta Azaria, “with no idea what I was doing,” after law school. Katie was overhorsed, but she said “Fleta” taught her everything. Over the following years she purchased and bred a few more horses, but none of them were inclined to jump. So Katie started concentrating on dressage with Rocky, a 16.3-hand Paint-Percheron cross. But her dream of jumping never quite disappeared, and after moving to Colorado, Katie befriended a group of eventers. She began to help her new friends at events, making them margaritas, helping with equipment, and cheering for them. She also volunteered, doing bit checks, scribing and jump judging. 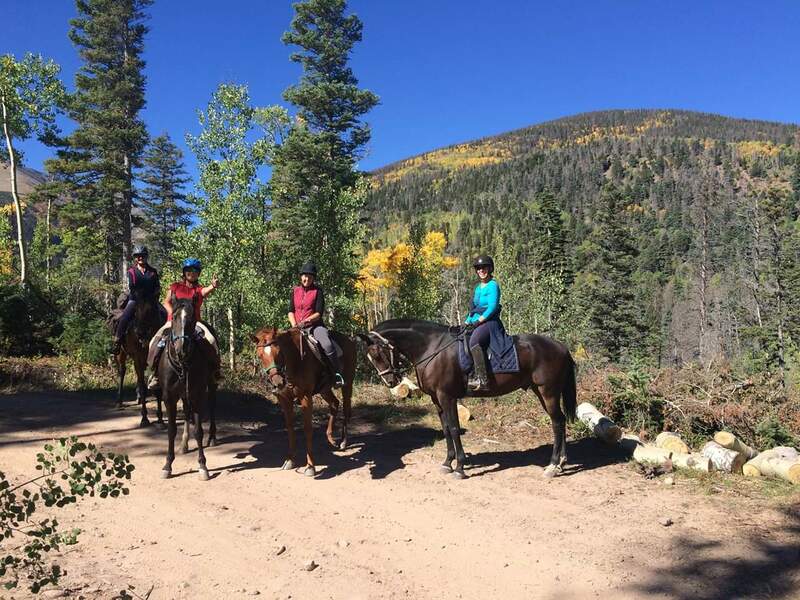 In 2018, Katie got her first taste of the eventing experience at the Arapahoe Hunt Cross-Country Pace (Colorado). Barnmate Christine Casillas led the pace on a former preliminary horse, while Katie followed in her dressage saddle aboard Rocky. Katie said some of the jumps were beginner novice height, but Casillas assumed she’d ride around them. When she looked back, there was Katie following along behind over the fences. Katie Knight hasn’t let blindness stop her from riding. Katie enjoyed the adrenaline rush, and it clicked for Rocky, at age 18, that jumping was fun. And with that, they hatched a plan. 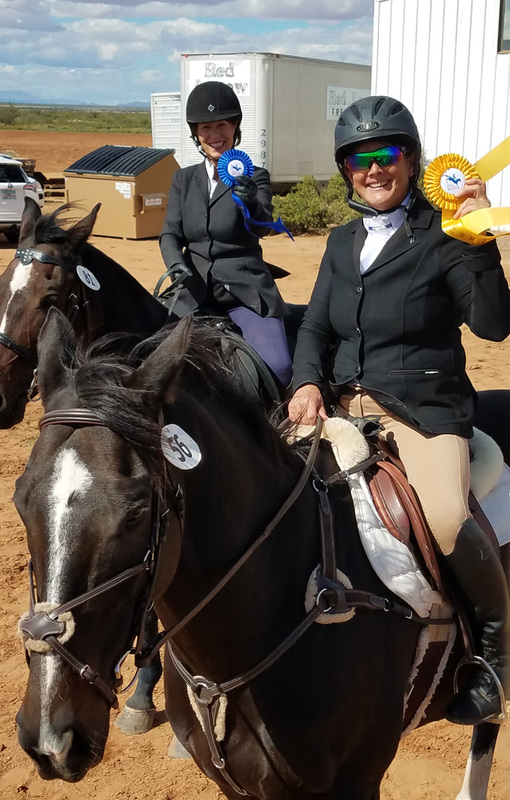 Lowatchie, 62, had just entered her last event of the season at Las Cruces Horse Trials, held Oct. 13-14 in New Mexico. She suggested asking the organizers if they would let Katie compete with a guide horse. Lowatchie would ride her own Ruben’s Pride in front to help Katie find the fences on cross-country. While Katie knew her lack of vision would prevent her from doing a show jumping round, she was game to try a combined test with dressage and cross-country, so she called up the organizers and asked. “The gal took a deep breath and said, ‘OK, why not?’ ” Katie said. Katie Knight (left) and Anne Lowatchie at the Las Cruces Horse Trials. Katie entered at the pre-competition level, which is below beginner novice. She walked the course several times with Lowatchie. When they got out on course, Lowatchie would call out the fence number, and Katie would remember what was coming next. “So we did it, and it was super fun; I want to do it again!” she said. Katie said one thing she thinks made her braver was a 2017 trip to Westport, Ireland, where she galloped on the beach with her friends in a huge storm. “No one else could see, and I was like, ‘Welcome to my world,’ ” she joked. Katie hopes to do more events and continue competing in dressage. She’d like to move up to first level and do a musical freestyle, concentrating on the fun, not the ribbons. Her advice to others who ride in the face of obstacles is, “Believe in yourself, because if you think it will hold you back, it will. “I’m hoping more people will try it if an old blind lady like me can do it,” she added. Do you know a hard-working amateur who should be spotlighted? Email Lindsay at lberreth@coth.com with your idea!